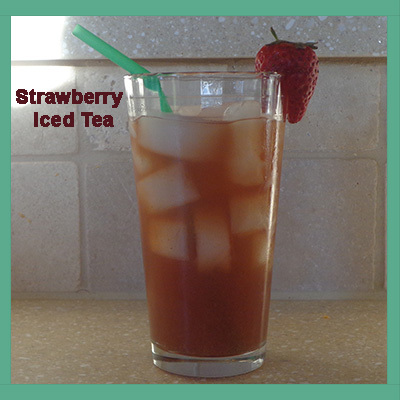 No matter where you live, if iced tea is a drink you enjoy, you are sure to enjoy this recipe. I actually got the idea from my husband. I had gone to Wendy’s and ordered their strawberry tea. I later told my husband about it and how much I enjoyed it; of course, he had to try it for himself. Later, he called me and told me about how he had been ordering it and taking it home and dumping it into his pitcher of tea he already had in his refrigerator (he works away from home). A few days later, he called me and told me he puréed some strawberries in his Magic Bullet and poured them into his iced tea. He said it was delicious. So, of course, I had to try it at home, as well. The result was very good. Okay, so I finally beat my soda addiction to now become addicted to strawberry iced tea (progress, not perfection). What other fruits can I think of to purée and add to my iced tea? I hope you enjoy it as you sit on the veranda watching all your sweaty yard men (or women) take care of your lawn and gardens (a woman can dream, right?). Don’t forget, strawberries also have antioxidants, so tell yourself you are doing something good for your body. Enjoy! Brew tea bags in 2 quarts of water. In food processor or blender, puree 8-10 strawberries. 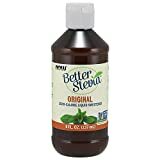 Sweeten individual glasses with zero-calorie liquid stevia.